Farming was not a single "invention" - it's now thought it developed gradually over centuries in various places. 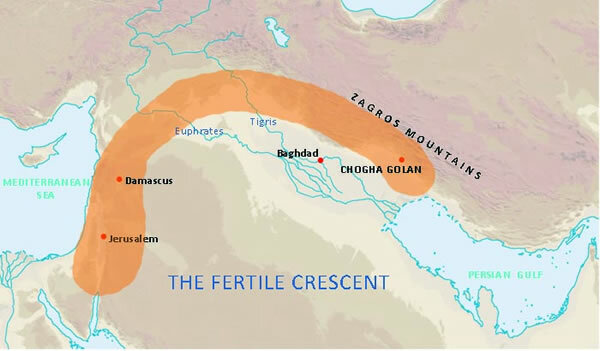 But the first evidence for it comes from the Fertile Crescent (the arc of land stretching from the Mediterranean to the Zagros mountains, with Iraq - Mesopotamia - as its heartland). 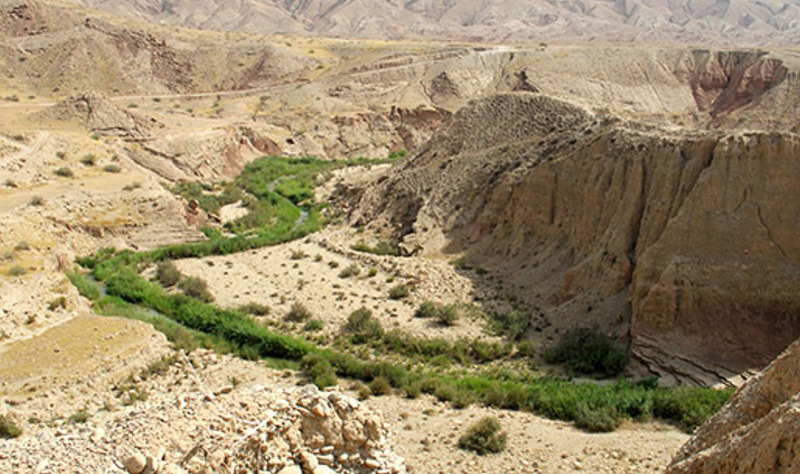 The best evidence - recently published (2013) - comes from Iran, from Chogha Golan, a site in the western Zagros, later to be Elamite terrritory. 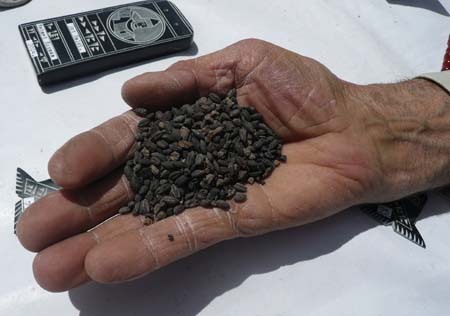 To prove that actual farming was going on, you need plenty of charred seeds, whose species can be identified, and which can be dated accurately. Such evidence has been hard to come by - until the excavation of the mound ("tell") at Chogha Golan. It was continuously occupied from 12,000 years ago until around 9,500 years ago: during this time archaeologists and experts in ancient plants can detect a gradual change in the grains: wild at first, but over time showing evolution towards crops still in cultivation today: barley, various kinds of wheat, lentils and peas. Weed seeds have helped too - the presence of the sort of weeds found in farmers' fields is good evidence that crops were being deliberately sown. Stone implements for grinding and crushing seeds (pestles and mortars, querns) have also come to light (these were still stone-age people: they knew nothing of metal, and did not make pottery - and they were still hunting big animals). Bones reveal that domestication of goats was just beginning at the same time as cultivated cereals were being developed - just as elsewhere in the Fertile Crescent. It's quite possible that ideas - and maybe even seeds - were exchanged among the various early farmers in the region: in different parts of the Fertile Crescent they were experimenting with different species. The earlist evidence for the cultivation of lentils (lens culinaris) comes from Tepe Sabz in Iran, and dates from 5,500 - 5000 BC. For more on ancient lentil cultivation in Iraqi Kurdistan see this Guardian article. Farming - domestication of wild plants and animals - was happening all over the Fertile Crescent from about 10,000 BC, it's now thought - thanks to evidence from a site in Iran which shows continuous occupation for over 2,000 years. Evidence for the development of agriculture in the Fertile Crescent is several thousand years older than the first evidence in Mexico and China. Recent DNA analysis of modern domesticated wheat compared with wild wheat has shown that its DNA is closest in sequence to wild wheat (einkorn and emmer) found on Mount Karaca Dag20 miles (32km) away from the Neolithic site at GObekli Tepe in south eastern Turkey, suggesting that this is where modern wheat was first domesticated. Archaeologists always hope to find seeds which have been lightly burned - enough to stop them germinating, and not enough to make them turn quickly to ash. Over 21,000 individual samples of plant remains were collected at Chogha Golan. Archaeologists separate the plant material from the dirt very simply - by mixing it with water so the interesting stuff floats to the top. Were living in rectagular (not round) buildings, and were able to process grain on a large scale: we don't know what they did with it after grinding. The chaff was used to reinforce the mud used for building (another source of information for archaeobotanists). Other things were found in the settlement, showing that they were not isolated: sea-shells, bitumen, ochre - and obsidian: a volcanic glass used to make sharp tools. They also made little figures out of clay and bone (humans and animals).